My Shop Information in Second Life. New release: Pearl set "Blossom"
YABU SIM 1st Birthday Hunt! Set up is too easy. Follow the instruction. Fish require a minimum of 3 cubic and a maximum of 11 cubic meters to swim. Do not place the Fish on the edge of your land. If you place the fish under Linden water, the fish will automatically swim under the water surface. 1) Rez the Fish from your inventory. Move the Fish to the start point where you would like them to swim from. 2) Touch the Fish, set the options if needed. BrightOFF: Set to full bright off. BrightON: Set to full bright on. Size: Chage the fish size. 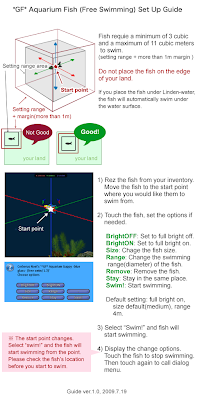 Range: Change the swimming range(diameter) of the fish. Stay: Stay in the same place. Default setting: full bright on, size default(medium), range 4m. 3) Select “Swim!” and Fish will start swimming. Touch the Fish to stop swimming. Then touch again to call dialog menu. # Select “Swim” and the fish will start swimming from the start point. Please check the fish’s location before you start to swim.